LGR’s Hydrogen Sulfide Analyzer (H2S Analyzer) measures H2S in ambient air and in industrial processes with extremely high precision, sensitivity and accuracy. 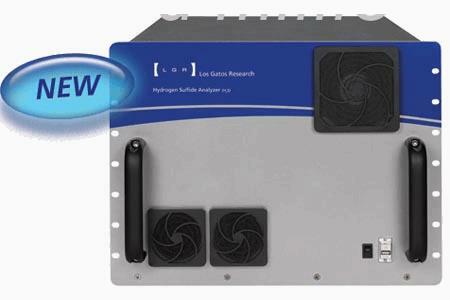 No longer do you have to wait a long time to measure hydrogen sulfide gas with high reliability – LGR’s H2S Analyzer provides measurements every second with extremely high precision. In addition, the H2S Analyzer can report measurements quickly over a very wide range of H2S mole fractions even in complex process flows. LGR’s H2S Analyzer is available in different versions to allow users to select the model most suitable for their needs. LGR’s “high sensitivity” model is designed for ultra-trace detection of H2S in ambient air, industrial process streams, or wherever highest detectivity is required. LGR’s “industrial” model is designed for high accuracy measurements in complex processes which contain H2S at levels that can exceed the dynamic range of other analytical techniques. Moreover, only LGR’s analyzers provide reliable guaranteed measurements at mole fractions more than 20 times ambient levels. Both versions are available in LGR's "Enhanced Performance" (EP) series. LGR’s EP series incorporates proprietary internal thermal control for ultra-stable measurements with unsurpassed precision, accuracy and drift. For portability, LGR offers our new H2S Analyzer in the Ultraportable package. For simultaneous measurements of H2S and NH3, please see LGR's H2S/NH3 Analyzer. The H2S Analyzer uses LGR’s patented Off-axis ICOS technology, a fourth-generation cavity enhanced absorption technique. Off-axis ICOS has many advantages over conventional first-generation cavity ringdown spectroscopy (CRDS) techniques such as being alignment insensitive, having a much shorter measurement time, and not requiring expensive and power consuming auxiliary components. As with all LGR instruments, the H2S Analyzer includes an internal computer (Linux OS) that can store data practically indefinitely on its internal hard drive (for unattended long-term operation), and that can send real-time data to a data logger through its analog, digital (RS232) and Ethernet outputs. Furthermore, all LGR instruments may be fully controlled remotely via the Internet. This capability allows the user to operate the analyzer using a web browser anywhere.